The issue of gene drive organisms is being discussed at the 14th meeting of the Conference of the Parties to the Convention on Biological Diversity (CBD), the ninth meeting of the Parties to the Cartagena Protocol on Biosafety and the third meeting of the Parties to the Nagoya Protocol [pdf] on Access to Genetic Resources and the Fair and Equitable Sharing of Benefits Arising from their Utilization, taking place from 13-29 November in Sharm El-Sheikh, Egypt. The CBD members are currently discussing a draft decision on synthetic biology. An unofficial draft decision (non-paper [pdf]) was issued on 21 November, after several closed discussions, which are still ongoing. One of the blocking elements on the draft decision is the inclusion, or not, of gene editing in horizon scanning, monitoring and assessing of developments regarding the potential positive and potential negative impacts of synthetic biology. A press conference was organised on 18 November at the CBD COP by Friends of the Earth International and the African Center for Biodiversity, as a number of civil society groups have been recently calling for a moratorium against releasing gene drive organisms in the environment. However, she said, the applications for gene drive organisms are broader than in the public health sector, and biotechnology companies are very active in the agricultural sector, as well as in the military. Referring to the interventions of countries this week on the issue of gene drive organisms, Mayet said African governments [which according to sources were mostly against a moratorium] are forgetting the precautionary principle, and the protection of biodiversity. It is like African governments “have fallen from grace in the last couple of years at the altar of the Bill and Melinda Gates Foundation,” which has been “dishing” millions of US dollars to African governments and scientists throughout Africa, she said. “We now find ourselves in a position in international negotiations where we have an African Group that slavishly replicates the position of the industry,” she added. Jim Thomas, from the ETC Group, noted that some 20 years ago, the CBD adopted a moratorium on terminator technology (through which seeds were sterile). Twenty years later the “exterminator technology” can spread through the whole ecosystem and wipe out entire species. It is increasingly clear, he said, that the main interest for this technology is not health applications, but agricultural technology. Geneviève Lalunière from the Via Campesina said gene drive organisms could contaminate peasant seeds, and present a risk to food security. She noted that peasant seeds contribute to 70 percent of global food. Ricarda Steinbrecher, member of the Federation of German Scientists, said the technology cannot be contained. When those gene drive organisms are released, they cannot be called back, she said, adding that a number of scientists had voiced concerns about the technology. For Mariann Bassey of Friends of the Earth, the African population is going to be used as “lab rats” if field experiments release experimental gene drive mosquitoes into nature. This view was shared by Ali de Goamma Topsoba, speaker from Burkina Faso. He said the experiment is due to be conducted in Burkina Faso, Mali, and Uganda in the context of the Gates Foundation-funded “Target Malaria” project. He too said the population of those countries will be used as guinea pigs. “This is widely acknowledged by gene drive developers, and Bill Gates, who funds the Target Malaria project,” she added. Finally, she told Intellectual Property Watch, “the role of mosquitoes in the ecological system is not understood and thus ecological risks of potentially eradicating them is unknown.” One of the concerns, she said, is the spread to other mosquito species (other than those carrying malaria) and whether the eradication of one species would lead to a niche replacement with other species, which may also carry disease. According to sources, Bolivia is actively supporting the moratorium. Madagascar also supported it while the European Union and Switzerland have moderate positions. The African Group is opposing the moratorium, as are Canada, Argentina and New Zealand. At the heart of civil society discontent is the Target Malaria project, which receives core funding from the Gates Foundation, and the Open Philanthropy Project Fund. Further funding comes from organisations such as the Wellcome Trust, the European Commission, and the Ugandan Ministry of Health. Malaria is estimated to have caused 438,000 deaths in 2015, according to the project, adding that 70 percent of those deaths are children less than five years old. The project aims as reducing the number of female malaria-transmitting Anopheles mosquitoes (since only female mosquitoes bite). Upon the opening of the CBD COP, the Outreach Network for Gene Drive Research published an open letter signed by a number of scientists, mostly involved in gene drive research, detailing the benefits of gene drive technology for conservation and public health, and opposing the moratorium. The African Union’s New Partnership for Africa’s Development (NEPAD) published the report of the High-Level African Union Panel on Emerging Technologies (APET) on Gene Drives for Malaria Control and Elimination in Africa in June. “Although still in an early development stage, gene drives present realistic options for effective disease control,” the report says. “It will certainly take many years before actual outcomes are ready for field deployment, but potential benefits for African countries against malaria will almost certainly be extensive.” This technology could potentially apply to other vector-borne diseases, it says. The report details two technology options: population suppression and population alteration. “Development of the gene drive technology should follow a stepwise approach, starting from laboratory development to full field releases, where efficacy and safety are adequately monitored alongside risk assessments to guide decision making and implementation,” it says. The report was criticised [pdf] by the African Center for Biodiversity in November. “The infancy of the technology and the lack of underlying scientific evidence supporting it as a realistic malaria eradication tool raises serious ethical questions regarding the current hype and public relations drive pushing this risky techno-fix onto vast populations and ecosystems in Africa,” it said. 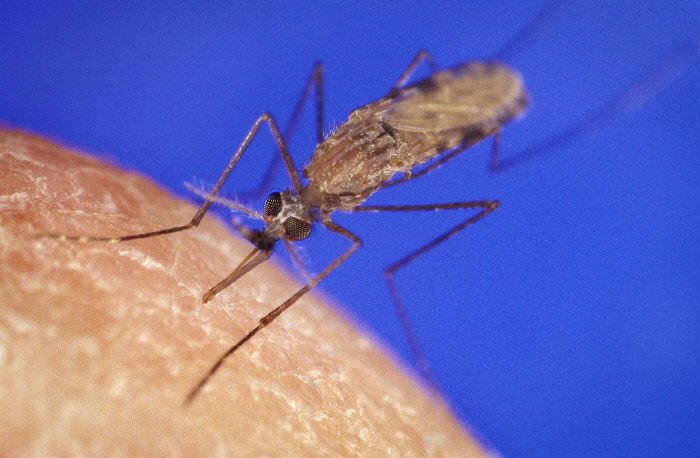 The first phase of the Target Malaria project is to release genetically modified male sterile mosquitoes (which are not gene drive mosquitoes), as part of the experimentation. A collection of civil society groups said in a release that they do “not feel represented by the delegations of Nigeria and South Africa, speaking on behalf of the African Group, in their attempt to speak on behalf of the people of Africa on the issue” of synthetic biology and gene drive organisms. “As Africans, we do not wish to be lab-rats for Target Malaria’s experiments. We refuse to be guinea pigs for their misguided disruption of our food systems and ecology,” the release said. According to the report, a number of patent applications for gene drive organisms relates to agriculture. Gene drives are being engineered into flies, insects, worms and other pests to spread sterility as a biological alternative to pesticides, the report says, adding that researchers are also proposing to use gene drives as a breeding tool to increase meat production in livestock, and patents have been sought to engineer gene drives into honeybees to control pollination patterns using light beams,. The report also analyses two key patents on gene drives and shows that they each reference around 500-600 agricultural uses, including brand names of 186 herbicides, 46 pesticides, and 310 agricultural pest insects, moths, and others. The ETC Group also said that the gene drive mosquitoes project is sidelining “the well-proven techniques that have eradicated malaria in scores of countries,” most recently Paraguay and Sri Lanka. The gene drive technology is based on the clustered regularly interspaced short palindromic repeats, known as CRISPR technology, a gene-editing method. The discovery of the gene drive mosquito was made by researchers of the Imperial College, London. No gene drive organism has been released into nature yet. The High-Level African Union Panel on Emerging Technologies report said ownership of intellectual property for gene drives is an issue of concern that needs to be addressed. Being signatory to the global access plan, it added, requires that the products from Gates-funded research are made available at reasonable cost to the communities that need them most and that the results are published on open access platforms. "Gene Editing: Fears Lead To Call For Moratorium At CBD, Discussions Ongoing" by Intellectual Property Watch is licensed under a Creative Commons Attribution-NonCommercial-ShareAlike 4.0 International License.